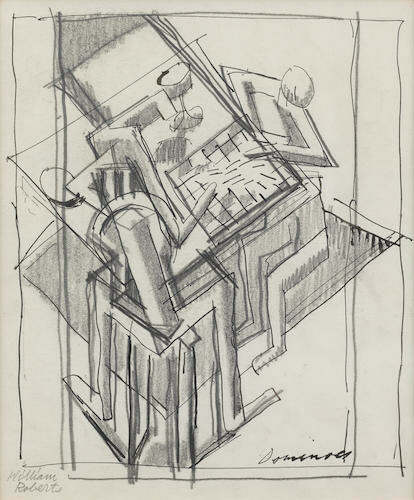 Roberts suggests this study 'could be a rough draft for one of those lost pictures, that was named in the  Grosvenor Gallery catalogue as "Le Jeu" (Roberts, 8 Cubist Designs (1969), where he appears to be misremembering the location of 'Vorticist Exhibition. The Vorticist Group: The First Exhibition of the Vorticist Group', which was held at the Doré Galleries in JuneJuly 1915). Though it is inscribed with the title 'Dominoes', the players are clearly playing a board game.